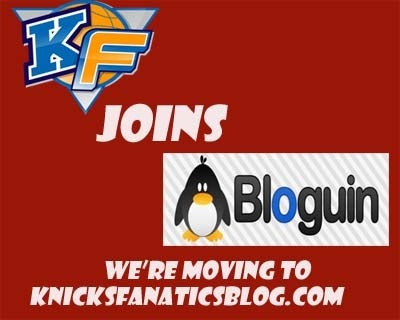 We are extremely pleased to announce that Knicks Fanatics has joined the fast growing blog network, Bloguin.com. 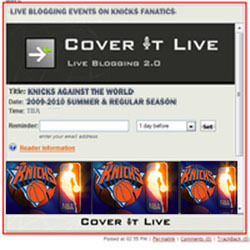 The new site at KnicksFanaticsblog.com will open on October 16th, 2009 and will immediately become our permanent home for the 2009-2010 season and beyond. This move by Knicks Fanatics marks an historic moment in our growth. In April, after the Knicks season ended early, we moved our independent blog to WordPress.com in search of more professional functionality and ease of use for our community. Since the move, our exposure, and therefore our community, has continued to grow but at a more rapid pace despite it being the off-season. Today we will surpass 20,000 views since we opened the doors here. In April and May we had a combined 2011 views. Last month (which included the hilarious “Happy Week”, we peaked at 5,080 visits for the month. Perhaps that’s not much in the grand scheme of things when compared against the blogs tied into large media networks, but for a little indie blog it speaks volumes about how important it is for Knicks fans to have a venue to express and e-hear (i.e., read) non-mainstream voices and perspectives about our favorite basketball team. We picked Bloguin because they picked us and in the process of discussing their plans for the future, we concluded they were doing a great job in collaboration with indie blogs and that the Fanatics community would benefit greatly by joining their network of blogs. It all started with a nice message, left on our “About” page, from Dave Kelsey, one of the founders of Bloguin. After I confirmed that Dave wasn’t a spammer rodent, I entered into what turned out to be great discussions with the Bloguin founders which included Dave, blogger and former Yardbarker exec Ben Koo and medical-doctor-to-be, Derek Hanson. They offered three things which I decided not to refuse: 1) An opportunity to grow our audience and resources for better coverage of the Knicks and NBA; 2) absolute and total control of our blog content and 3) a little chump change from the ads sharing our blog space. You will see that the result of those collaborations is a space we can continue to be proud to do our thing at. Bloguin.com started a year ago. The concept behind the venture was to provide resources to sports and entertainment bloggers to enhance their resources, aesthetics and financial viability while offering greater distribution to advertisers. On October 28th, the one year anniversary of Bloguin, the community will be about 100 blogs strong including 21 professional basketball blogs. We expect to see you at the new space when we open. I recommend that you go to Bloguin.com now and register. Take a look around the neighborhood while you’re there. I’ll provide more details about the open house as we get closer. Finally, big ups and credit to the Fanatics family for making this move and continued progress possible. The biggest props go to Peaceman who had the foresight to put up a bare bones blog page and throw it in my lap for development, despite my protestations regarding starting and managing a blog . It was that move by Peaceman that has captured my imagination and inspires me to make sure we have a safe place to provide the best venue for adult sports blogging. There was a time when the Knicks would leave everybody else in stitches (as in laughing wildly), but these days its the Knicks players who are getting stitched up. Last night, in order to counteract the Knicks first show of aggressive defense all pre-season, Elton Brand got away with throwing wild elbows after a rebound and he caught Jared Jeffries on his right eye. Jared, who had a very mixed game despite his incessant hustle, wound up with a bloody gash which had to be sewn back together. Unfortunately, the Knicks and Danilo Galinari’s shot also need mending as they continued to shoot poorly (30.9%) in their 93-85 loss to the 76ers. Nevertheless, many of the Fanatics who watched the game and communed at the Live Blog last night saw some positive signs, at least for a brief period of time before half-time. The most significant occurrence was the Knicks playing swarming, pressing defense which disrupted the 76ers who clearly need a true point guard. The other point, which we hope D’Antoni fully absorbs, is that Milicic looks far better at the fie spot than an excessive dose of David Lee, who gives up too much defensively to guard the position for more than a hot minute. Milicic is credited with 2 rebounds, 1 steal and 1 block in 14 minutes, but his play was more consequential than his stats as he helped with a defensive charge that saw the Knicks take control in the second quarter. I’ll have more notes on the game later but for diverse and insightful real time impressions you really should read last nights LBE. We had a full house of Fanatics including the Czar (O&B), Peaceman, JayBee, Tman, Post Up Prince and our old buddie, DaJoka (DVJ), whose daughter turns one next month. We also had some sharp newbies in Miller. 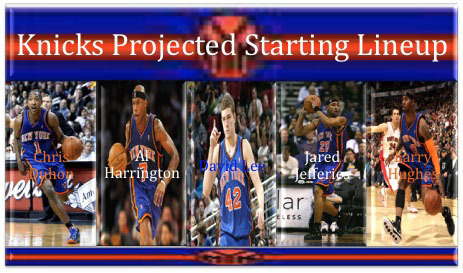 It was like old times and makes me really hope that I am wrong about this season’s Knicks being a bust at 35 wins max. BTW, I don’t think the Laker Dancers have anything on Miami (an inside-LBE joke – check it out). In this video, Nate Robinson, who has no problem sharing his personality with the public, talks about his various tattoos on Tattoo U. Interesting stuff, but Nate makes it hard to defend him against the knucklehead label – he admits that as a youngster the more his Dad told him not to get tats, the more he felt encouraged to do it. Still, Nate isn’t all defiance and excess energy; he shares with us that many of his tats carry very spiritual and personal significance. It seems that most of his tats have something to do with his relationship to God or are reminders of very important people who have influenced him from his deceased brother to Allen Iverson. Good afternoon, Knicks fans, and it is a good afternoon because y’all are one day closer to the end of this miserable decade. Perhaps the most interesting thing Sheridan said was that the Knicks were going after LeBron and Bosh and that they were competing against Miami for the assets. I see them trying to get LeBron and Bosh, one through a sign-and-trade and the other in a straight up signing. That would be the expanded Plan A. I think Miami has sights on making a play for both those [g]uys too, maybe Boozer instead of Bosh if he stays in Toronto, and [p]utting both of them alongside Beasley, Wade and Chalmers. a pipe dream, maybe, cuz they’d have to accept less than the max, but the Heat think they have a puncher’s shot at pulling it off. Despite the belief that Milicic has strengthened the Knicks defensively, what he has done thus far is not very impressive. He lacks consistency in terms of defensive effort. D’Antoni thinks that Milici is simply not ready to play at his speed yet. "He’ll get his shot down when he gets comfortable," D’Antoni said. "He’s only been playing this style for two weeks. He knows how to play. That’s a key. We’ve sped the game for him. Everything’s going 100 miles an hour for him." In Berman’s Milicic story, he also noted that D’Antoni said the Knicks did not miss Quentin Richardson’s leadership. Jared Jeffries is going to be in the starting line-up instead of Danilo Galinari. Chris Duhon, Wilson Chandler, Al Harrington and David Lee will also be in the starting unit. D’Antoni thinks Gallo is just in a minor funk. According to Marc Berman, Galinari was very upset about how he played. I like that attitude. Remember, you cannot measure how much heart can improve, enhance or transcend ability. After Friday’s ugly 96-84 loss in Boston, Gallinari’s body language in the locker room spoke volumes. At his locker, he was cloaked in a black sweatjacket, hood pulled over his head. He snuck out of the locker room as reporters spoke to Lee. The writers caught up with Gallinari outside. The Italian Stallion seemed more upset than at any point during his pain-ridden rookie year. Some are starting to blame Gallo’s legs for the shooting woes, but common sense does indicate that the combination of conditioning and recent major back surgery will slow whatever Galinari’s progress will be. It’s not time to panic yet. After all remember how poorly Crawford started the preseason last year. Craw was using hte season to get a feel for the game in D’Antoni’s system and eventually he and ZBo caught on. So it is a little early to press that non-functioning eject button. O.K., I’m really awake now. What had happened was . . . .What year is this? 2007? Hey somebody tell Coach Zeke to come to my office so I can slap his hands for this. . . .Say what? He went to Florida? Did he retire? He should have after that pre-season debacle? Oh he’s with another team now. FI Who? FU Too. Well tell his azz to get back here; he forgot to take his losing culture with him. What you say? The losing culture wasn’t his for keeps? You say, that ghost named Boo is a resident of MSG and Zeke was just borrowing it for his stay in New York like most of the Knick admins before him? You mean that was not Zeke’s Boo for keeps? You mean our boy not only got Anuked but he was being haunted by a dawg named Boo too? No shyte? I digress, but speaking of Boos, can somebody tell me how in the hell a married David Letterman humps his employees in the office (and anywhere else he can tell a joke) but the press fallout is little more than feature stories on the prevalence of workplace relationships? Can somebody tell me how a married Rick Pitino, the master of OPP, is eating more than somebody else’s spaghetti in a restaurant kitchen after hours and he is still a good guy, but Stephon Marbury get’s his roll over minutes from a MSG employee in a pick her up-truck, and he is the devil? Something that makes you go hmmmmmmmmm. (Where is Arsenio anyway? Is he doing America’s Got Talent now. I wonder if he’ll let Minister Farrakhan play the violin on his show?). I’m sorry, I lost my train of thought. Oh yeah, I was thinking about the train wreck of a pre-season team being haunted by a losing culture. No, I’m not delusional. I saw those shadowy figures floating around Danilo Galinari as the best shooter that D’Antoni ever saw missed shot after shot. I could have sworn that Boo was altering tres and pushing the ball out of Duhon’s hands. No, I’m not crazy. I’m not delusional. As Warner Wolf says let’s go to the video tape. Check this out, and be careful because hopefully it will self destruct after playing (kinda like the Knicks, but they barely played). More of the story is told by the box score. Numbers aren’t lying this time. The Knicks shot 16.1% from the tre arc and 37.7% over all. The good news is that will probably never happen again. Since, I slept through the fourth quarter and I refuse to review the recording I made of the game, I can’t offer much end-game insight except to say I think the game ended in the first quarter. As a team the Knicks came out flat. Certainly, it is easy to understand that the group expectations were probably not great. The Celtics are loaded former champions. They just added Rasheed Wallace, an amazing advantage. So, it is easy to see that they could have felt doomed from the start. Also, the Knicks just released four players including Gabe Pruitt, Sun Yue and Warren Carter. It is possible that the release of competition was followed by lower energy and an absence urgency. I cannot understand how the Knicks would provide a subpar effort since most of them are playing for contracts and some, like Robinson and Lee, are playing to pay for bonus food money. Gallo is proving to be what I think he is, but it is early. The comparison to Jamal Crawford is still alive. Jamal had a horrible shooting pre-season last year. Gallo has been putrid. Knicks fans are developing a bad habit of claiming and extrapolating greatness based on competence. To project Gallo as a star this year is ridiculous and an unfair burden. He is not ready for the physicality and the speed of the game. He has not played regularly for over a year and he will not be in D’Antoni condition for a while. He is not ready. The scary part of his game, for now, is his poor defense — he had trouble guarding Ray Allen — his inability to get set quickly — he seems to be over thinking his form — and his relative offensive inactivity — he sits on the perimeter too much adn does not more around without the ball enough; he also does not show great ability to drive against NBA talent. The other key observation is the similarity between Douglas’ and Duhon’s stats. Duhon? Nice guy. Not a starting point guard. Douglas posted more steals, rebounds and points in fewer minutes. Douglas may not get into the starting line-up soon because of D’Antoni’s well demonstrated deference to vets, but Douglas will slowly pick up more and more of the PG responsibilities unless Walsh gets a new point guard which seems unlikely. It’s about time for Fanatics to offer their own previews. But in advance of those glorious moments, below are links and excerpts to a few of the more interesting and accessible Knicks Previews floating around the blogosphere. Enjoy. The Knicks have slowly climbed their way out of salary cap hell — but all that got them is a season in NBA purgatory. Instead of making moves toward actual improvement, the Knicks are blatantly looking past this season to next summer when they hope to strike it rich with the famed free agent class of 2010. But while Donnie Walsh’s long-term strategy may eventually pay dividends, it offers little hope in the interim that the Knicks might rise above last year’s fifth-place finish in the Atlantic. Consider their competition: the Celtics are a virtual lock to repeat as division champs, and the 76ers could return to the playoffs if Elton Brand returns to form; the Raptors would like to join them after fortifying their roster with a handful of free agents; and even if the Nets spin their tires in the win-loss column this year, at least they’re doing it with a clearly-established young nucleus. The Knicks, on the other hand, consist of an odd collection of expiring contracts (including Larry Hughes, Al Harrington, Darko Milicic and Chris Duhon), previous mistakes (namely Eddy Curry and Jared Jeffries) and promising but flawed youngsters. But no matter how optimistic you may be, there’s no denying that this roster is constructed to bide time, not contend. All that’s left is figuring out which players will be around when Walsh attempts to sign the biggest pieces of the puzzle next summer. Donnie Walsh is the right executive for this team. Mike D’Antoni’s the right coach. And soon enough, they’ll have the right players. Or, at least, they’ll have a chance at them. And it’s just not worth commenting on any of these players because they won’t be Knicks in 12 months time. Danilo Gallinari(notes) will be, and he looks like a stud. Jordan Hill looks solid, for a thin draft at least. Others might come back, but if Knicks fans have any say, they’ll be role players. Even the ones who are brilliant, like Lee. Or explosive, like Robinson. So take in one more year of nonsense. It might not net you LeBron or Bosh or Wade or even Carlos Boozer(notes). What are the Knicks’ biggest strengths? The Knicks should thrive on their versatility. There are few pure position players on the roster, with a number of guys who can play and guard multiple positions. Expect Mike D’Antoni to use this to his advantage, as he’s already brought up the notion of a 6’8”-and-over lineup (with Danilo Gallinari running the point), and experimented with a number of unorthodox lineups throughout training camp. Don’t be surprised to see a unit with a 6’10” shooting guard and a 6’8” center at some point this season. D’Antoni’s got the tools to create mismatches aplenty on offense, and adjust to mismatches on D.
Also, the fact that like half the guys on the team have expiring deals could cause a cosmic alignment of contract years that somehow catapults the Knicks into the playoffs. Stop laughing. What are the Knicks’ biggest weaknesses? Despite small additions a concerted effort from Coach D’Antoni, this team still doesn’t really intimidate defensively. The acquisitions of Darko Milicic and Toney Douglas should deter the occasional drive to the basket, but it would take a truly dramatic improvement to be considered an even average defensive team. Additionally, the Knicks still don’t have "that guy". After roster shuffling last year, New York was left without a truly reliable scorer to pick up the slack when things went badly and make it happen in crunch time. D’Antoni will rely on relatively young players to make game-winning decisions. It’ll be exciting, but a real gamble every night. How will the Knicks ever win playing Euro-ball and not playing any defense? It’s true that last year’s Knicks, by any standard, were dreadful defensively (23rd in defensive efficiency, 28th in eFG% allowed, 2.9 Blk% and 0.24 blocks/foul – the block numbers are less than half of most of the rest of the teams in the league). Historically, D’Antoni’s Phoenix teams were most effective defensively through unorthodox means, but the system broke down last year for the Knicks because of the lack of any interior presence, the poor help defense, and especially toward the end of the year, poor transition defense. Unless Lee, Robinson and Harrington count as honorary Euros, however, this defensive futility isn’t a Euro or D’Antoni specialty — it was simply a function of personnel. The coaching staff isn’t blameless, but with injuries, player turnover, and lack of size, it was difficult to put together effective lineups that could get stops. There is purportedly an increased emphasis on playing defense in this year’s training camp (help defense in particular), and irony of ironies, an offensively-challenged European player (Darko) is going to be one of the key players in providing an interior presence. Another one of those dastardly international players, Gallinari, shows above average intelligence with defensive positioning and reading screens. The coaching staff has explicitly stated a goal of being in the middle of the pack in terms of defensive eFG%. That would be a major step forward and could make the difference in winning close games and challenging for a playoff spot. In the bottom-half of the Eastern Conference there is a chance for virtually any team to sneak into one of the final couple of playoff spots. This will also likely include the Knicks. However, it doesn’t appear the Knicks have what it will take to win more than 40 games this season. Expect the team to win 30-something games and stay focused on the summer of 2010. Heck, with all the hype that has surrounded the Knicks and what could happen next summer, some might wonder why the Knicks are even bothering to take the floor this season. One thing is certain: New York darned well better hit a homerun next summer to justify the team’s conservative approach this summer. Last season the Knicks shook up their leadership team, and while team president Donnie Walsh and head coach Mike D’Antoni are probably the right guys to lead this team into a new era, we’re not talking about a quick-fix. Fans in New York are counting the days until LeBron James and Chris Bosh sign with New York in 2010, but that’s far from a guarantee. The focus must be on who’s in the locker room today, and today it’s murky at best. Draft picks Toney Douglas and Jordan Hill have potential, but the Knicks are still much more about tomorrow than they are about today. This team is still at least a year from winning much of anything but the lottery. The Knicks won just 32 games last year and weren’t a player in free agency this summer while other Eastern Conference bottom-feeders Washington and Toronto improved dramatically. It is a good thing New Yorkers have the Giants and Yankees. The Knicks are certainly capable of winning more than 32 games, as they did last season, but not a whole lot more. To be .500 in the Eastern Conference means making the playoffs, and New York doesn’t have a roster that looks as though it can do that. Regardless, small improvements are expected and another full year of Mike D’Antoni can’t be all bad. Expect 34-36 wins and another frustrating season. The most important thing for the New York Knicks this season is to develop a supporting cast capable of luring away LeBron James or another high-profile free agent and clearing up more cap space. Because of that the wins are not going to pile up, but they’ll still be competitive with guys like Nate Robinson and David Lee playing for a new contract along with their talented young pieces. The Knicks are going to finish fourth in the Atlantic Division and likely miss the playoffs, but that doesn’t make the season a failure for them at all. The New York Knicks are in big trouble. While they did finally secure David Lee and Nate Robinson for the upcoming year, they’ve also completely failed to make a discernible splash this offseason. Instead of taking advantage of their nearly endless funds in a weak economy where no other buyers existed, the Knicks sat on their hands in the name of signing two max free agents in 2010. I’ve got news for you Knickerbockers, it could just be a dream. Most marquee free agents end up staying put. LeBron probably isn’t coming. Bosh probably isn’t coming. Wade probably won’t come either. Sure maybe you’ll land Amar’e Stoudamire and another tier two All-Star, but it’s not like $30 million in cap space is going to buy you a championship quality team when Danilo Gallinari, Jordan Hill, and Wilson Chandler are the only other semi-effective players on the roster. The Knicks needed to solidify their roster this season, but didn’t get it done. And here’s some more bad news for you, this season your team is probably lottery bound, and you’re not even going to have the pick. For a little more Knicks bashing, as well as some positive points, come on over the jump.